At 1:15 am, on June 6, 1944, as most people in German-occupied Normandy were asleep, the largest air armada ever assembled was passing overhead. 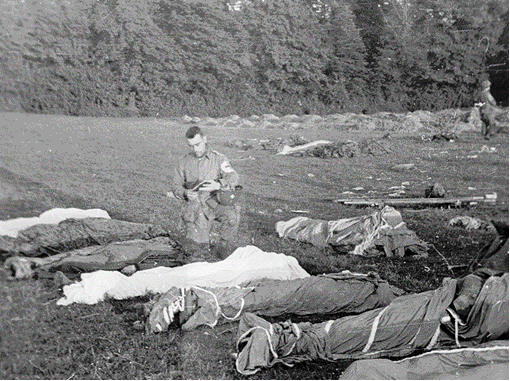 The 882 U.S. planes began to disgorge their contents, thirteen thousand paratroopers of the 82nd and 101st airborne divisions. The Americans’ task was to secure a number of causeways and create safety zones where gliders could land to bring in reinforcements. Offshore, five thousand ships carrying two hundred thousand men were assembling. Operation Overlord, the Allied invasion of Europe, had begun. It was D-Day! Among those dropping in the dark sky was Fr. Francis L. Sampson, a young, Catholic chaplain, making his first combat jump. Landing in a deep stream, he cut away his pack and chute, and then repeatedly dove into the water to retrieve his weapons: a Mass kit and holy oils, items he soon would need. Father joined other paratroopers as they made their way to a French farmhouse that was being used for those who were severely injured. A Protestant chaplain was there and the two of them provided first aid for most of the day. When it was clear that some of the men needed a doctor’s care, Fr. Sampson left to find the regimental aid station. Shortly after locating it, a decision was made to pull out. The chaplain volunteered to remain with the men who could not walk. German troops soon overran the house. Two soldiers took the priest outside and raised their rifles to shoot him, but a German noncom, a Catholic, stopped them. Father was allowed to return to the wounded. That night, the house was shelled collapsing a portion of the roof and killing several men. The Americans soon regained the position, and the priest accompanied the injured to the division hospital, where he assisted the unit chaplain in spiritually administering to some 500-600 wounded men. Fr. Sampson was in combat for another three weeks, working with aid men to rescue the wounded, offering Mass, hearing confessions, anointing the dying, and praying for the dead. Francis Sampson was born in Cherokee, Iowa, on February 29, 1912, but grew up in Dalles, Oregon. Ordained in 1941, he served briefly as a parish priest before enlisting in the Army. While in Chaplains School, he volunteered for the paratroopers and was assigned to the 101st Airborne Division. Three months after Normandy, Fr. Sampson took part in an airborne assault on Holland. Upon jumping behind enemy lines, he and the regimental doctor set up an aid station in a castle. The priest went to locate the commanding officer, and while he was away, the Germans seized the position. In December, the enemy forces began a massive offensive, known as the Battle of the Bulge. Learning that a number of American paratroopers were machine-gunned and left on a nearby road, Father went to aid them. He ran into a German unit and was taken prisoner. In the ensuing days, he and a growing number of Allied prisoners were marched from Belgium through Luxembourg to Germany. On Christmas Eve, while in a school auditorium, American planes bombed the area. Father led the men in prayer and spoke of the presence of Christ among them. Over a ten-day period, the prisoners were marched 185 miles, before 1,500 of them then were herded into overcrowded boxcars. For six days, they were without food and their only water was snow scraped from the tops of the boxcars as they traveled to a prison camp in Germany. Fr. Sampson was the only Catholic priest among over 5,000 Americans in a camp that held some 80,000 prisoners of various nationalities. He had the men build a chapel in his barracks, where he held daily Mass and non-denominational prayer services. On Good Friday, Fr. Sampson led the men in the Stations of the Cross and gave a meditation on the life of Christ. On Easter Day, he joined with French, Dutch and Polish Catholic priests, who were imprisoned, to concelebrate a Solemn High Mass for several thousand prisoners. After four months in the Stalag, the Russians liberated the camp. Fr. Sampson briefly left the service before reenlisting. When the Korean War started, Father was with the 11th Airborne Division. Shortly after the Americans landed at Inchon, the North Koreans retreated north, with the 1st Cavalry Division in pursuit. The 11th Airborne was ordered to cutoff the fleeing enemy, and Father made his third combat jump. As the Chinese had entered the war, the Americans were severely outnumbered. Father was busy administering to the men, including saying five Masses on Christmas Day to accommodate the dispersed units. After the war, Fr. Sampson remained in the service. In 1967, he was appointed Chief of Chaplains of the Army, with the rank of major general. Upon retiring, he was appointed as head of the USO. During the Vietnam War, he annually spent Christmas with the troops, and was untiring in visiting hospitalized soldiers. 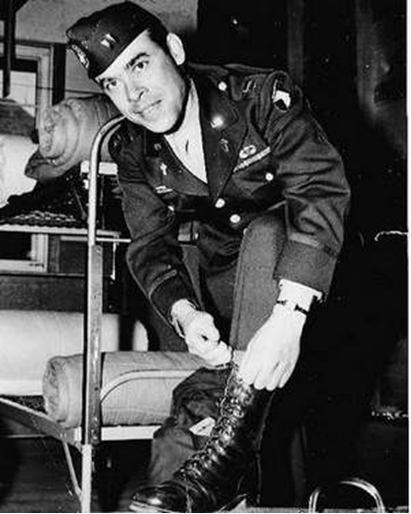 He died in January 1996, having received many military honors, including the Distinguished Service Cross for his heroism at Normandy and the Distinguished Service Medal.